It’s the best time of year along South African shores: whale watching season! I observed more whales than I could count along the 70km coastline at De Hoop Nature Reserve, in the Western Cape. This UNESCO Natural World Heritage Site is also one of the largest marine protected areas in Africa, and it was here that I also reacquainted myself with nature for a few days. Glinting flukes elegantly emerge from the water, but soon slap the surface in a controlled and rhythmic manner. Each time the flukes rise, a half-formed arch of water outlines the trajectory of their movement, it briefly hangs suspended in the air, before raining down. Another Southern Right Whale lunges into the air, metres away yet another spy hops and a third – which actually turns out to be a mother with her calf – logs at the surface. It’s an outdoor classroom with our knowledgable guide, Delfrenzo, as our teacher. Whale season in South Africa stretches from June until November. It sees hundreds of Southern Right Whales swim northwards to the warm waters of the Agulhas Current to calve. An aerial count estimated around 700 whales during my visit. Once the calves gain strength, the whales leave this ‘nursery’ and make their way westwards, where they follow the whale trail along South Africa’s south western coastlines, all the way to Namibia, to the nutrient-rich cooler waters of the Benguela Current. We watch the live National Geographic documentary unfold before us. Luckily, the gourmet picnic lunch that awaits on the wooden table bench a few feet away will not get cold. Marcia, the head chef, has prepared a cheese board with an assortment of crackers and preserved figs, salmon wraps, a homemade baguette with a volcano-like cheese filling and an asparagus and sundried tomato green salad. After lunch I dig my toes into the sand and listen to the soundtrack of the ocean and the whistled weeps of the African black Oystercatchers. The undulating sand dunes seem to be one of two possible namesakes of De Hoop – which means the heap (of sea sand) or ‘of hope’ in Afrikaans. I have left my book on my bedside table and so instead I walk along the wooden footpath, atop the low cliffs to take photographs. Even when the whales aren’t around, there is much to experience at this 36,000 hectare protected nature reserve within the Overberg region. It’s been classified as a UNESCO Natural World Heritage Site due to the conservation efforts of the Cape Floral Protected Area and the historic importance of the buildings. It’s well worth visiting for a long weekend away or an entire week and park conservation fees are only R40 per adult and R20 per child, per day. 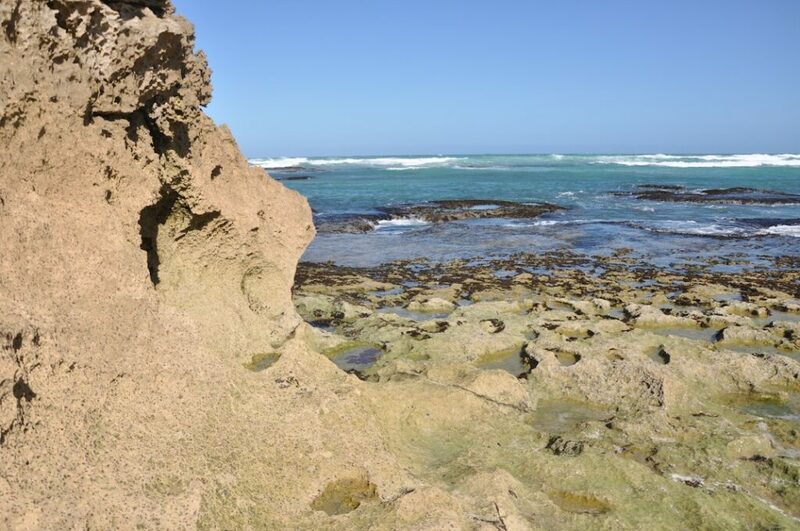 De Hoop is a mere three-hour drive from Cape Town. The last stretch is awash with generous brush strokes of yellow as the dirt road is flanked with canola fields in the springtime. A complimentary guided bird and fynbos walk along the vlei – a shallow lake – will be included in your stay (excluding campsite bookings), if you book for at least three nights. The distance covered and difficulty can be adjusted according to your groups’s fitness level and endurance. Who knows how many of the reserve’s 260 bird species you will spot before breakfast. I delighted in the two-hour Interpretive Marine Walk that explores the rock pools and intertidal zone at low tide. We learnt about the feeding habits of starfish, that sea urchins shield themselves from the sun with empty mussel shells and who would’ve thought that barnacles could be so intriguing. We also spotted a blue anemone, who waved hello. Later we took to the open road during a guided eco-quad bike trail. Although there are 1,500 plant species at De Hoop, it’s best known for its pincushion proteas and other types of fynbos. The numerous cycling, walking and hiking trails throughout the reserve offer the chance of game viewing too. That night, upon the owner’s recommendation, I tried the fynbos-infused Gin Verdant from Inverroche Distillery in Stillbaai, with delicate slices of orange zest and proceeded to savour it each evening. And that’s the abridged version of why I now love gin. After the bird songs fade along with the evening light, the night sky becomes illuminated. Paraffin lanterns are blown out as we begin stargazing. Delfrenzo tests our astronomy general knowledge. He points out zodiac signs and constellations, while teaching us how to determine true south in the southern hemisphere. Just as each family or group is unique, so the De Hoop Collection offers a variety of accommodation options, each of which presents a different experience. Just to mention a few: adventuruous families can camp, otherwise the two-sleeper, self-catering Camp Rondawels look out onto the vlei and the open-air, conch shell-like, wrap around showers are certainly part of the experience. There are self-catering equipped cottages, but if you want a break from the kitchen the restaurant awaits. The Opstal Manor House Suites include breakfast and dinner. We stayed on the other side of the vlei that stretches for 17km across the reserve and requires a quick boat ride across, although you can drive around with your 4×4 it’s not as much fun. The eight-sleeper limestone <strong>Melkkamer Manor House, which was built in the early 20th century, was recently refurbished, yet it retains its air of the English countryside with its four-poster beds, antique furniture, wooden floors and rustic décor. Even though the spacious farm-style kitchen makes it the ideal self-catering unit, we opted for Marcia to cater to our appetites, while we read on the veranda overlooking the vlei. When you go to De Hoop, please send Marcia my regards and tell her we’ll be coming back for the peace and quiet, whales and her clam chowder. I was hosted by the De Hoop Nature Reserve, I maintain full editorial control of all content published on this website, but you already know that. Photo credits: Iga Motylska and De Hoop Nature Reserve.